I was just cruising around the terminator of the Moon, testing the new cooling equipment on my OTA, when I found a very interesting mountain chain with some ruined crater at one end, near the crater Aristarchus which was right on the terminator. The view was so spectacular, that I decided to make a sketch. I found out that the large crater was Prinz, and the mountains attached are Montes Harbinger. 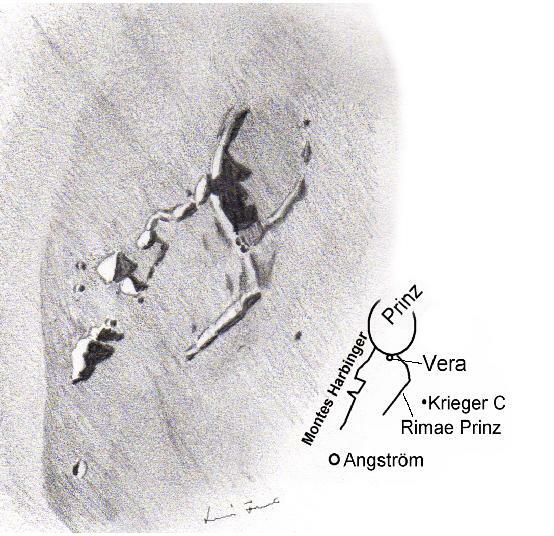 I’ve sketched some additional minor craters nearby that have been cropped out from this image. A really unusual view, worth taking a peek when it’s near the terminator!